A Ragdoll is always a Pointed Cat with Blue Eyes! Are you asking yourself "why?" a lady ... in distant California, using a certain visual judgement and special instinctive assurance, discovered something special in the neighbour's cat's litter of kittens. Some of the kittens were bigger and stronger, remarkably affectionate and extremely impressive in their overall appearance. This lady (Ann Baker) decided to create a new variety and bred several cats of known and partially unknown origin with each other to develop these desired characteristics. There were matings with pointed cats as well as non-pointed cats. So it was in the nature of things that both pointed and non-pointed kittens could be found in the litters. But only the pointed kittens were of interest to Ann Baker because these were the cats she wanted to concentrate on breeding at that time. By 1970, there were a total of 65 Ragdolls registered by Ann Baker as pointed (masked) cats with blue eyes. 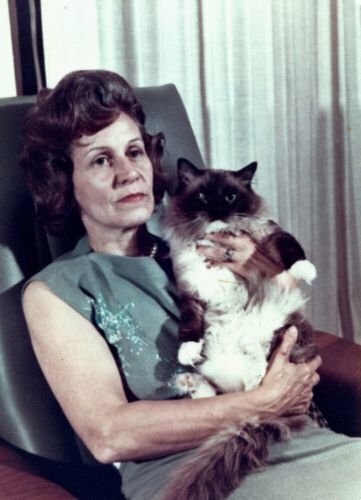 Ann Baker was still the only Ragdoll breeder. She had succeeded, by the special selection of character and appearance, in creating a wonderful new breed of cat. A fairy tale history and, like every good fairy tale, there are legends and myths in it’s history of origins. There will never be complete certainty about everything that actually happened in the beginning of the Ragdoll story because the Ragdoll is a ‘man-made’ breed of cat and not a naturally occurring one. As is generally acknowledged, a grain of truth lies in every myth and legend. 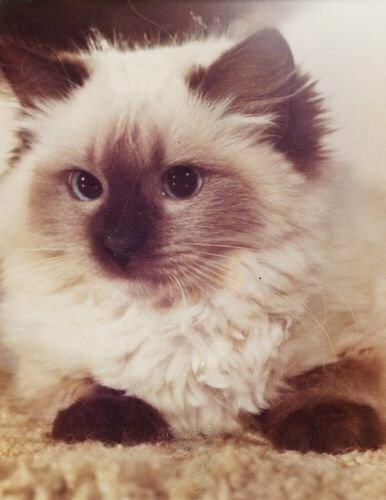 In the case of the Ragdoll, it is a proven fact that Ann Baker originally recognised the Ragdoll as an extraordinary, wonderful, strong and gentle charactered pointed (masked) cat with blue eyes and that she bred for these characteristics. To this day, it is no wonder that these beautiful colourpointed cats find more and more enthusiasts and devotees. The Ragdoll is recognized in most feline associations worldwide exclusively as a pointed cat with blue eyes! THAT, together with their pleasant nature, is exactly what makes the Ragdolls something really special. This "total package" alone is the "true" Ragdoll! POINTED CATS with BLUE eyes!